The CSUN kiosk offers a variety of CSUN gear in the middle of the Northridge Fashion Center during the holiday season. Photo by Michael Lennon. 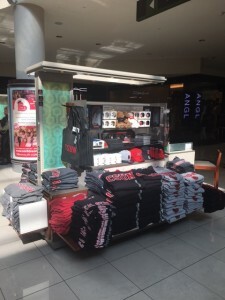 For the fifth consecutive year, the Northridge Fashion Center is hosting a California State University, Northridge kiosk to offer the latest CSUN apparel and branded gifts to the local community. Off-campus Matadors can gear up on CSUN merchandise such as T-shirts, hoodies, keychains, notebooks, mugs and much more while finishing their holiday shopping at the Northridge Mall. In collaboration with the CSUN Campus Store and The University Corporation, the kiosk is entirely run by CSUN students who, in turn, earn some additional money for the holidays. “We want to be able to provide the community with easy access to CSUN-branded gifts and apparel,” said Michael Lennon, associate director of retail operations at The University Corporation. The kiosk is located on the first floor of the mall — just outside of JCPenney — and will run through the end of the year.